Facilities that use large amounts of electricity have often heard of demand response programs, or are active participants. 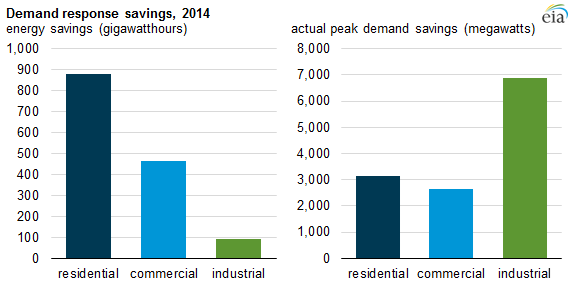 Demand Response programs typically compensate facilities based on curtailment during a specified time period. The utility or market operator will call an event during times when the electrical grid is under a considerable amount of stress from high demand or lack of adequate generation. Ultimately, more generation is produced or curtailment is called to help prevent a rolling brownout or blackout. For many organizations, the idea of shutting off, curtailing, or adjusting energy use can be a scary thought! Whether you’re a building manager concerned about tenant comfort, a data center operations manager who is worried about uninterruptible power, or a plant engineer focused on product quality, you’ve got a business to run and your operations come first. When running your business, although you may not have a dedicated energy manager, someone has to be responsible for keeping the lights on. In many cases, small to medium sized businesses can easily manage their energy buying themselves by locking in a fixed rate. But what you do if your business is large, has a lot of locations, has a complex energy profile, manufactures goods, and so on? Then what? You either manage your energy yourself or you hire a broker. Are High Generation Charges Taking a Bite Out of Your Energy Budget? Summer isn’t all bbq cookouts and relaxing by a pool side when you own a business. Your operations during the hottest season of the year actually plays a significant role in your future energy costs. Too Much, Too Fast. The Rise And Fall Of SunEdison Inc. It seems likSunEdison Inc. just can't catch a break. After a stagering 99% reduction in stock value in the last 12-months and gearing up to face Securities and Exchange Commission and Justice Department investigations, SunEdison representatives made the unexpected move to file for Chapter 11 bankruptcy last Thursday as the shadow of nearly $11 million debt load looms ahead. They don't know if they'll save enough money to warrant the effort. I have only one response to these concerns: Can you really afford not to enroll in one? Demand response has been around for quite some time, and early adopters have been reaping the rewards for years. Given the recent Supreme Court ruling on FERC 745, demand response growth is "expected to result in faster growth in demand response in the wholesale electricity markets that cover about 60% of U.S. power supply" according to the EIA. During periods of intense heat or cold, consumer usage drives demand, which intensifies the strain on the electricity grid. Increased strain causes grid instability, which can result in brown outs or even rolling black outs. So how do grid operators protect against this potentially dangerous situation? The answer, demand response (DR). DR enables businesses to voluntarily cut back on their electricity consumption when demand on the grid is high and grid stability may be compromised. For their participation, businesses are paid for acting as an insurance policy against grid failure.